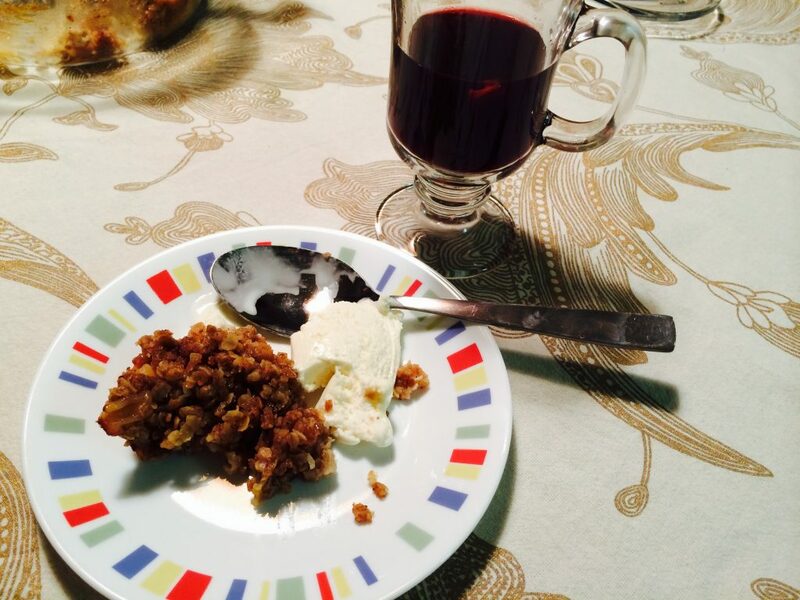 Mulled wine literally translates into wine that has been sweetened or flavoured with mulling spices. In its other literary avatar, the word mull means to ponder. 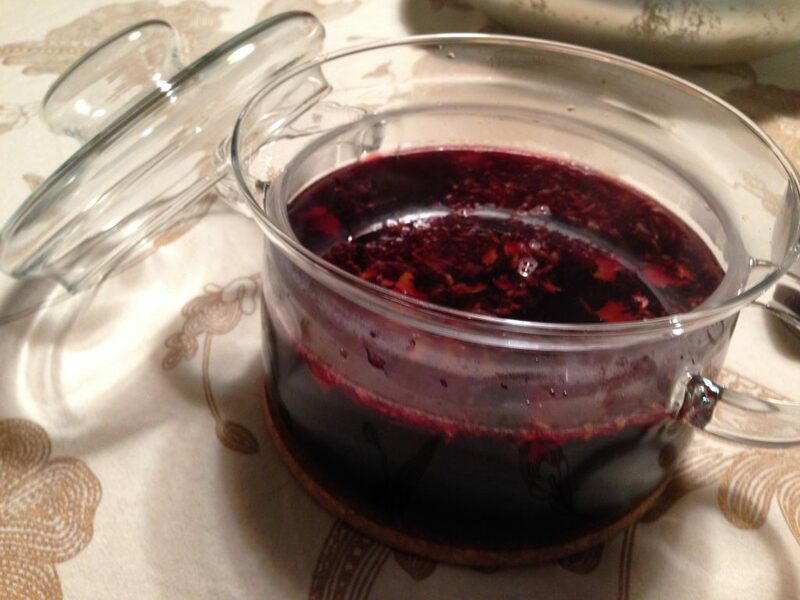 Why not then spend some time mulling about life with a glass of warm, spicy mulled wine? Share it with a friend or two and a perfectly dull winter’s day will end with free-flowing conversation and mirth. Never let an opportunity go waste, especially when it concerns food and wine. That’s exactly what we did over the weekend. The mister and I got ourselves a bottle of full-bodied Cabernet Sauvignon and some brandy. 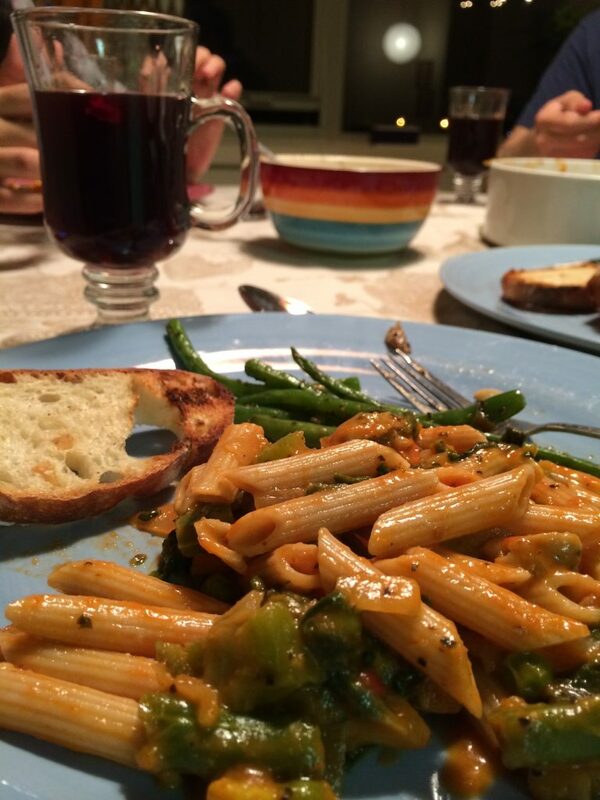 The next order of business was to invite friends, make the mulled wine and cook dinner: Pasta primavera with chicken followed by pear crumble! Perfect end to a weekend spent indoors imploring the sun to show its face and rid us of the grey, dullness of winter. 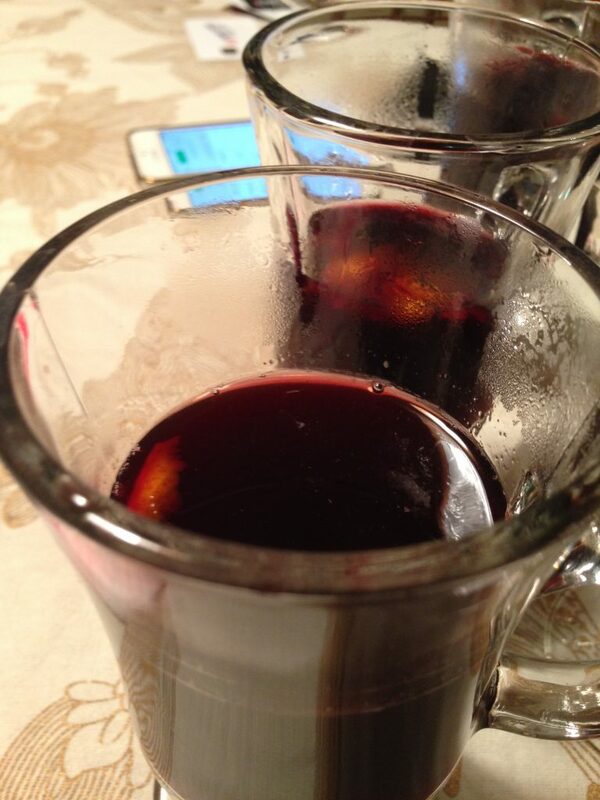 A little background on mulled wine; this is a drink commonly served during the festive season (i.e. Christmas) in most of Europe. As I was researching about the different combinations used to make mulled wine, I stumbled upon one version called Gluhwein, literally glow-wine, an Austrian-German mulled wine. There is also a version made in Scandinavia called Glogg. While there are minor variations in the ingredients, all of them are lightly sweetened with sugar or honey and spiced with a combination of cinnamon, cloves or star anise. 1 (750ml) bottle of red wine, Cabernet Sauvignon, Merlot or Zinfandel. 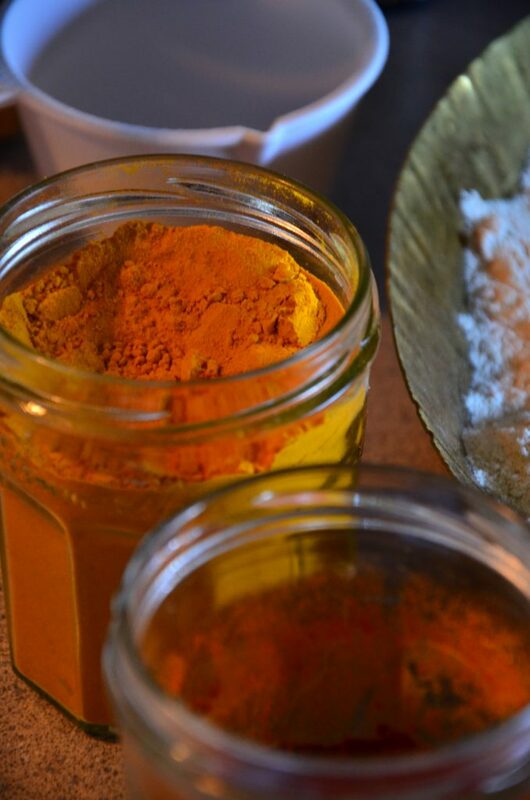 Ginger, grated about 1 tablespoon. roughly, you will need an inch long, quarter-inch thick piece. 8-10 or more whole cloves. 4-6 tablespoons sugar in the raw or brown sugar. Juice of 4 oranges, zest of two. To begin, wash, peel and grate ginger. Keep this aside. Next, juice four oranges. Before you do, zest the peel using a peeler. 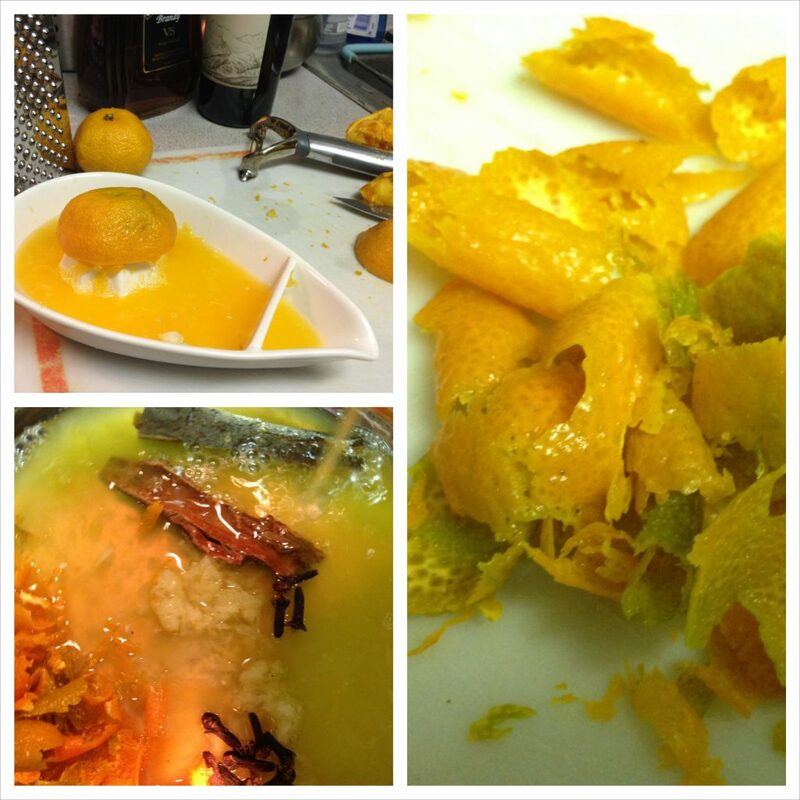 This, I, found was an easy way to get shavings of the outermost layer of the orange peel. But feel free to use the grater, making sure you don’t end up taking the white layer on the inside of the peel. That is usually bitter. Next in a saucepan, do not use a non-stick or an aluminium pan, add the juice, ginger as well as the whole spices. 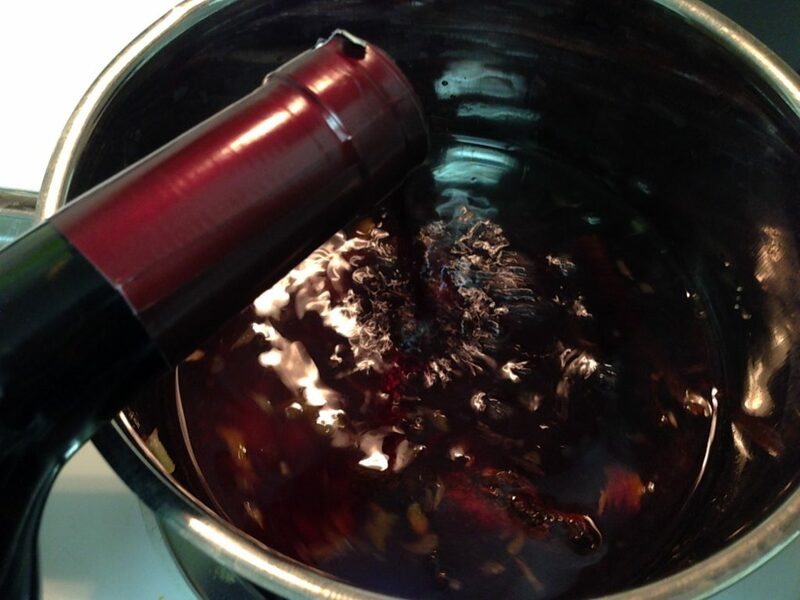 Next open the bottle of wine and pour it all into the pan along with half a cup of brandy. Finally, add honey and sugar. I split the sweetener into sugar and honey because my husband isn’t a fan of honey. I didn’t want honey to overpower the drink. But, if you do not have such a limiting factor go ahead and use only honey. Let this mixture cook on the stove at medium or low heat. Make sure you do not over cook. The wine should only be allowed to reach boiling point and then taken off the heat. With some hot water, warm up the cups that you will use for serving. 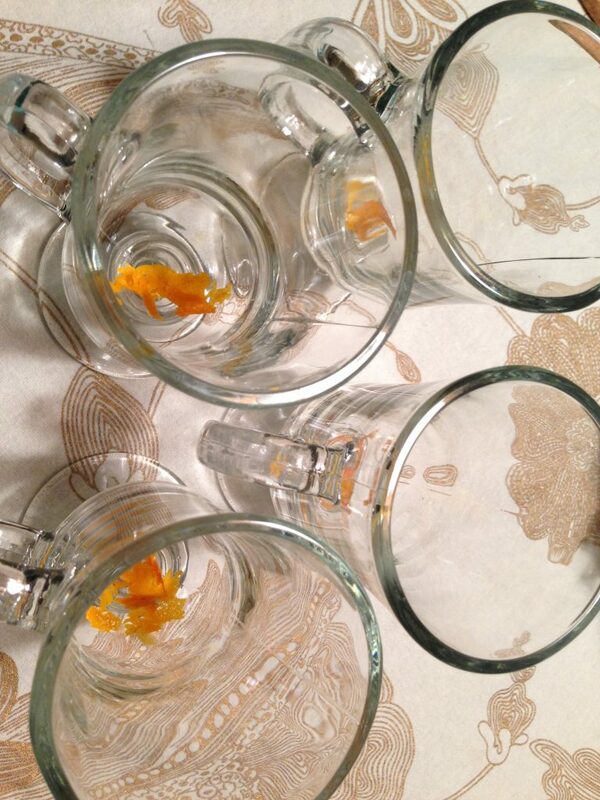 Pour in the wine, make sure you strain it and garnish with orange zest. Enjoy it with your dinner! Finally, sit back and enjoy! Be careful though, when warm the orange and ginger pack in quite a kick. 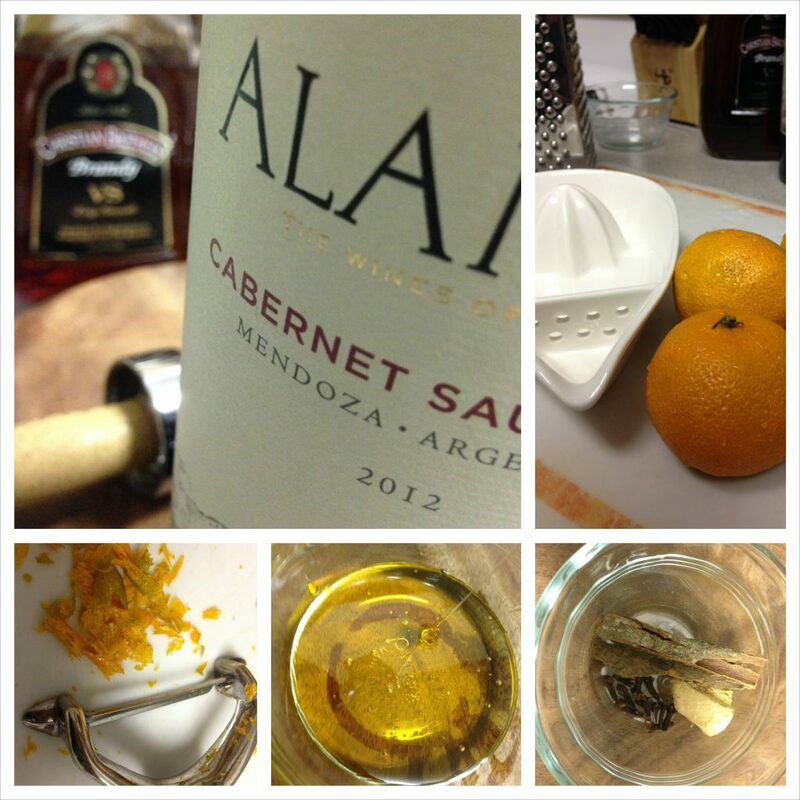 *Note: Here’s the story on mulled wine that inspired me to make my own mulled wine. Thanks Hina! Hope you will enjoy it just as much as we did 🙂 I am a wine lover too, its an acquired taste for sure! Thanks for sharing Nisha! Hope I get to travel to Poland!